In this article, we will talk mainly about the Syma X8C Venture, heir to the famous Syma X5C drone that we have already talked about. Note that this is one of the best choices for users who want to enter the world of drones at an acceptable price or who already have some experience and want a drone with suitable dimensions and capabilities. 1 x Manual in English. The Syma X8C comes with spare parts for thrusters and protectors, and its assembly is not difficult to perform. The Syma X8C is a drone designed to be used by people aged 14 or older. Therefore, its assembly will be without much difficulty. And the truth is that this assembly step will not take more than 30 minutes or so for the drone to be ready for the flight. But read all the instructions carefully. Following the instructions of the manual, the assembly is quite straightforward. Connect the battery, place it in its compartment, mount the camera, connect it, screw the 4 landing gear and finally attach the thrusters. The assembly of thrusters requires special attention. This is why it is necessary to read the manual before assembling them. The Syma X8C comes with hubcaps for the cavity where we mount the protectors. We will have to remove before inserting the mounting screws. Be careful because there are different types of screws. But probably the most crucial step is to check that the propellers are aligned with the motors of letter A or B according to their direction of rotation. And you must be careful to adapt each propeller with the corresponding engine, so you do not have to find yourself in the same situation as us. Indeed, we mounted two propellers in the wrong position which meant that the drone did not rise. As per the quality of construction of the Syma X8C, it must be said that it has its advantages and disadvantages. On the one hand, we have a chassis made of nylon and high-strength plastic that is quite capable of withstanding some shocks. This will be of great benefit to new users who are not yet experienced. So you do not have to worry if the Syma X8C is your first drone because it is a very durable device. Being a relatively cheap drone, the engines are brushless. Same is the case of drones with a much more professional orientation, including the DJI Phantom. Note that the latter with the Syma X8C have a resemblance more than reasonable. But just click on the link given at the end to see the price of the Phantom to realize that the two drones do not play in the same segment. Therefore, it is entirely reasonable that the engines must be replaced after some uses. As we have only done a few flying sessions, we are not able to talk about the durability period of the engines. The aspect we liked the least with the Syma X8C is that propeller protectors are quite weak and tend to crack easily. Indeed, their design makes that during a hard landing, they tend to collide with the propeller causing the deterioration. The manufacturer has included only 4 protectors in the box, but they are not very cheap; so it’s not something serious. Nevertheless, we advise you to disassemble the protectors when flying with your Syma X8C in open areas and as soon as you have some flying experience. Also, if you do not put a hubcap, you can save weight in addition to some improvement in engine ventilation. Fortunately for the future buyer of this drone, in online stores, there are many spare parts. You can equip yourself with propellers and spare protectors for your Syma X8C or even batteries, motors and circuits. The Syma X8C is a pretty nice quadrocopter. 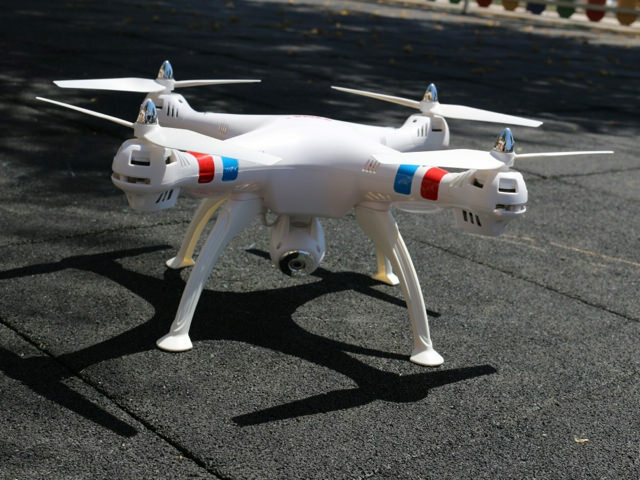 We have already mentioned its great resemblance to the DJI Phantom. It has 4 green and red LEDs through which it will be possible to perform night flights. Its dimensions are quite considerable, about 50 cm wide and long which makes it a much more serious option than other drones such as Syma X5C or Syma X12. It is available in white with touches of blue and red. But it is also possible to find it in pure orange or in black more elegant and more aggressive. Regarding the remote control, the manufacturer may have a bit of sin with a simple design in two colors that, in addition to being plastic, gives the impression that we have to make a toy rather than a professional quadrocopter. The Syma X8C comes in a very compact carton that protects the device and all parts. Even if during transportation from China it should suffer some shocks, as has been our case, there should not be big problems. As for the weight of the Syma X8C, it weighs 450 grams without the propellers, the battery and the camera. The battery weighs 104 grams, the camera weighs 27 grams, and the four protectors make 22 grams a total of 600 grams. If we consider that a Xiaomi Yi Action Cam weighs 73 grams, we can conclude that it is advisable to fly without bumpers or hubcaps when we install a heavier camera. Perhaps one of the best ways to reduce weight is to opt for the Mobius Action Cam 1080p HD Mini which weighs only 38 grams with excellent recording quality. The Syma X8C being the successor of the famous Syma X5C , it is quite reasonable that we seek to know the improvements it brings compared to its predecessor. First, from a design point of view, the Syma X8C is a much larger drone, as we went from 31 cm to 50 cm long and wide. It is also much higher than his predecessor. As a result, the Syma X8C looks more like a professional drone than the X5C. There are also improvements in the engine ventilation system and lighting, which also exists in the upper part of the drone in the case of the Syma X8C. Regarding video recording, there is little difference, to say the least, where the camera is exactly the same. Indeed, despite its appearance, the Syma X8C incorporates the same camera as its predecessor inserted in a second chassis that is, a camera in another camera. while the Syma X8C has a flying range of 100m. Although we can not confirm this information for fear of losing control of the device. Another advantage of the Syma X8C over the Syma X5C is that being a heavier and more powerful drone, it offers the possibility of installing heavier external cameras. But the flight autonomy can be a little diminished in this case. Although we have not tested the Syma X5C, we have the impression that the Syma X8C is more stable in flight, despite the slow take-off. Finally, the Syma X5C does not have a “headless” flight, while the Syma X8C has this feature. A little further we explain that. We will simply say, for now, that there is a special version of the X5C with the “headless” mode. How to Fly the Syma X8c Venture? There is enough detail about handling the Syma X8C. We will try to summarize them as simple as possible. The first curious thing about starting a flight session is that even though the remote has space for 6 (1.5V) batteries, in both ends we have two small pieces of foam that show that we do not will have to place 4 batteries. Why? We believe that Syma has designed this order for a future model with a larger range or with a second FPV display that would need two additional batteries. The rest of the command is very similar to that of the Syma X5C, but with some small changes such as the control of the camera which is now to the right of the left lever, instead of the upper right of the command. This location is on the control of this new model used to make 360-degree turns. We have the same LCD screen that tells us the different flight levels of the drone at every moment. This screen also gives details on the level of the battery or the strength of the radio signal we have. The first is the most usual flight mode; the left lever is used to determine the height of the drone and serves as a rudder to turn it on itself. While the right lever will allow us to move the drone forward or backward and in one direction or another. In the second mode of flight are exchanged the “horizontal” functions of the two levers and, consequently, the rudder will be in the right lever while the deformation will be done with the lever of control of left. To switch from one mode to another, press the button located under the right lever when you turn on the control. The LCD will inform us of the mode in which the drone operates. To return to the first mode, all you have to do is perform the same operation. As in the Syma X5C we also have two small buttons to properly adjust the settings of our Syma X8C, in case we notice that it tends to a certain direction even after the initial calibration. These buttons are located below the left lever for horizontal calibration and to the left of the right lever for vertical calibration. When putting the Syma X8C into the flight, we will have to synchronize it. To do this, once you turn on by pressing the switch located under the drone, it will turn on the remote control device to move the left lever to its highest position and then to its lower end. If this is successful, the Syma X8C should beep to indicate that we are ready for the flight. With its 6-axis gyro, we can make 360-degree loops with the Syma X8C, although it requires some handling of the device to carry out this maneuver. In the upper right part of the command, we also have a button to make 360-degree turns. But our recommendation is not to do this maneuver until you have some flying experience and be at a proper height to do it properly. To do this, press the button, then rotate the right stick in any direction. If you see that after a stroke or a certain flight time the drone is out of calibration in its horizontal movements, it must just be placed on a flat surface and bring the two levers to the bottom right corner for 2 or 3 seconds until the Syma X8C’s LEDs flash, indicating that the calibration has been done correctly. If, on the contrary, it is the vertical movements that are not working correctly, repeat the operation, but with the two levers in the lower left corner. As far as our flight experience with the Syma X8C is concerned, we can say that it has been pretty good overall. Although with experience in remotely controlled aircraft flights, with the Syma X8C it was our first experience with a quadcopter and it took a little time to start handling this drone. The drone seems very stable, with good reactions, a takeoff slightly slow because of its weight, but it can fly fast enough. Also, the rotation on itself is slow, so we can not say that it is a very explosive drone like the Phantom or even the JJRC H16 Yizhan Tarantula, famous for being a light drone with sports reactions. It is true that in our first flight session there was a strong wind that made the task a bit difficult and caused us a hard landing. Once you have mastered the handling better, you realize that it is a very versatile drone and suitable for both novice and experienced pilots, although it is advisable not to let the children fly in the absence of an adult. It is also strongly recommended to fly the drone in areas clear enough to stay away from senior citizens and animals. This is because the brush motors of the Syma X8C take a lot of strength once they are at full power. Let’s not forget that even though the company is called Syma Toys, the Syma X8C drone is a gentleman in its size and regarding the strength of its propellers and therefore it should not be considered a toy. Because it represents a certain level of danger in the event of a collision. As far as flight autonomy is concerned, the truth is that for the UAV specifications it seems quite realistic and the average duration is usually about 7/8 minutes of flight depending on the speed we use and how we use the video camera. The most negative point in this regard is the lack of power of the charger included in the box. It will take almost 3 hours to charge the battery fully. Although the manual says that it is not recommended to use other chargers, we believe that another specific and higher intensity charger is strongly recommended, in addition to some extra batteries. In the field of lighting, it must be said that for LEDs for night flights we cannot turn them off during the day to save the battery. But it must be said that they serve to guide our flight since the red lights are on the front panel. While the green lights are on the back of the drone. Although they are quite visible from the top, they do not have a great power, which makes it difficult to see them properly during a day flight. In this respect, the lighting of the Phantom drone seems to be more powerful. The Syma X8C has an interesting illumination for night flights or in low light conditions, although not very effective for daytime flights. When the aircraft is flown in “Headless” mode, the head of the drone is ignored, that is to say, there is no longer any distinction between front and rear. So the drone will fly in the same direction as the radio control lever. If we move it to the left, the drone will move to the left, if we pass it forward, the drone will move away and if we move it backwards the drone will fly towards us; regardless of the direction of flight until that moment. All movements are made based on the position of the pilot. This mode is very interesting when we will have lost the control or orientation of our drone we would like to return it. This mode is exciting and “artistic” when we turn the drone on itself, and we wish it to fly, at the same time, in a straight line as if it were a UFO. On the other hand, this is not recommended during video recording, because it will be difficult to know the direction toward which the camera is pointing. To activate the “headless” mode, you have to press for a few seconds on the button located in the upper left part which was also used to go from one speed to another. Once the button is pressed, the radio emits eight beeps that indicate that we want to go into headless mode while the Syma X8C’s LEDs will blink for 4 seconds. During this mode, we can continue to use the button to change gears and simply press and hold it for a few seconds until the long beep tells us that we are back in normal mode. As we already mentioned, the Syma X8C camera is the same as the Syma X5C camera. The fact is that we have a 2MP camera that is quite improved. The picture quality is quite regular, and as a video camera, the quality is passable with recording in 720p @ 30fps. But it suffers from a “freezing” effect which somewhat damages the recording. The camera can be fixedly adjusted to different angles, but only 3 positions limit the possibilities (forward, 30 and 60 degrees). Also, it tends to move if we make a hard landing; it is, therefore, advisable to review the desired position before starting a new flight. Fortunately for the future buyer of this drone, the Syma X8C has enough power to fly with cameras heavier than the one with which it is delivered. There are some users who have added a gimbal to fit an external camera like the GoPro or the Xiaomi Yi Action Cam. Two of the models used for their quality/weight ratio are the Mobius Action Cam 1080p and the 808 NO.16 V3 HD, much lighter and cheaper. The Community was quick to adapt some cardan joints to install external cameras like the Mobius. Fortunately for the “modders” landing gear, Syma X8C have a height of 95 mm on the ground to mount any cardan with his camera. To carry out a photograph, you have to push the button to the right of the left control lever up, while pushing it down the camera will start a video recording and stop when you push once again to the bottom. The Syma X8C comes with a 4GB Micro SD card to record our videos and a simple card reader with a USB adapter to easily transfer recorded files to our computer. Here we have the Syma X8C with one of our favorite action cameras, the Xiaomi Yi Action Cam. The Syma X8c is a great option for those who want to enter the world of quadcopters with some guarantees. It has dimensions and a power level more than good for a device that can be obtained at such a low price. The flight quality is good enough with handling that can be learned quickly with good stability in flight. It is important to take some time to learn how to calibrate and make adjustments to make handling and stability easier. If we want to have some experience before buying a drone with these dimensions, we can always use a mini-drone such as the Cheerson CX-10 I already had to talk about. It is obvious that this is not the most sporty and spirited drone in the market. Also, being a very stable drone, it is good to accompany a gimbal and a decent action camera and cheap as a video solution. We will not be entitled to the much more elitist options offered by the most expensive drones such as GPS, automatic return mode, an app to control the camera or an FPV mode. But again we must not forget that we are talking about a drone located in the segment of less than 100 dollars. Best review i ever read. You’re a legend Sir ! Awesome, very well explained. Thanks for the great article! Amazing Review. Keep up the good work. Copyright © 2018 · Paptia.com, All Rights Reserved.